Mightylite LED solar powered flood light in black, features clear lens for uniform light distribution. This light has 24 28-Watt LED lamps. Lamp in the light has color rendering index of 85 and color temperature rating of 5400K to ensure optimal light level in the room. 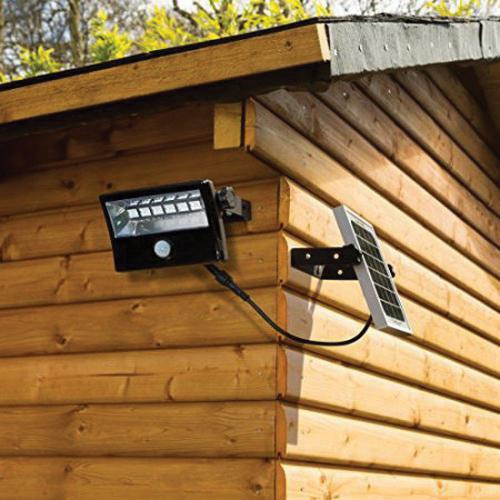 Patented intelligent solar lighting system automatically switches functions and continues to operate in almost all-weather conditions throughout the year. It works in areas where a mains power supply is unavailable or unstable. This light with photocell, utilizes the latest software PMS system that continuously monitors battery levels. It runs on 4.2-Volt battery of capacity 18-Amp-Hour for optimal performance. This IP65 rated light withstands temperature range of -4 to 122 deg F. It is suitable for both domestic and commercial applications. This light has average life span of 3 years.